Last night I realized it was Tuesday today and although in my head I had started a scrappy project, it was time to actually start it. Despite the fact that it was late and dark, I pulled some pieces of green and low volume fabrics off my shelves. I have decided that any fabric that has already been cut once, can be considered a scrap as I need at least a 9" strip and preferably 17" strips for these blocks. I read through my tutorial to make Blended Scrap blocks, and cut some 2" strips. As I was cutting, I cut two extra strips if there was enough fabric in my piece to do so. The extra cutting will organize these scraps into ready to use pieces for this project (and others too). My only debate is whether to start cutting 2.5" strips too, for possibly other projects. I am thinking I will. So already, working with scraps is making more scraps. Now I need to find a nice bin to keep them in. Late night sewing means bad photos. I need to do something about the light in my cutting area. I have been tidying it up as the new cutting table should arrive soon. I thought I would show you a picture of Reflection, in case you want to join me in making a blended scraps quilt. The tutorial is here. 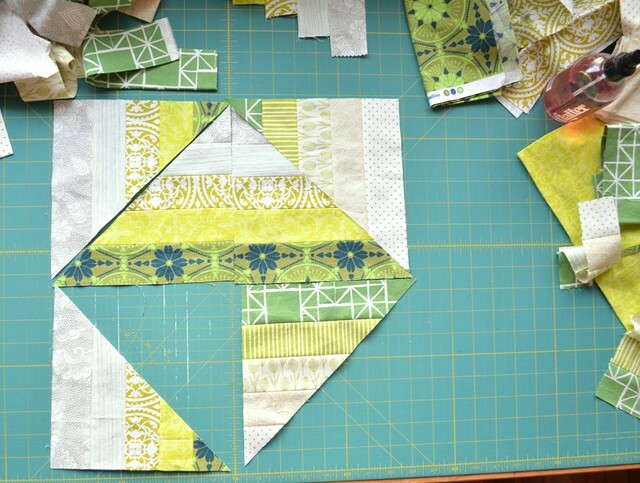 As these blocks end up being HSTs, the options for using them are endless. Just remember that they will stretch a lot so handle them gently, maybe spray them with starch or something - I use Flatter. 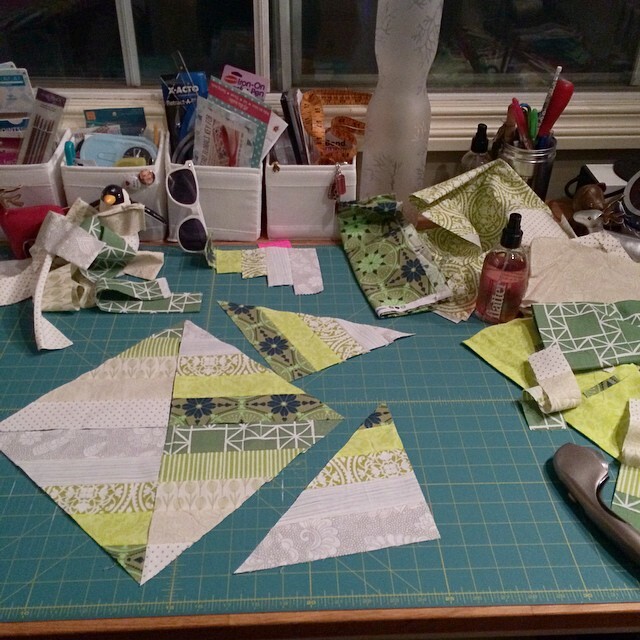 And today Nicky is starting a Liberty sampler quilt, head over to Mrs. Sew and Sow to see it. I have Liberty scraps, I'm not sure I will be able to resist joining her too. Next Tuesday - the second Tuesday of the month - we will host a link up for a scrap project you want to share - in progress or finished, and your scrap ideas and thoughts are welcome too. I'm going to find some prizes, let me know if you have one to give. Your new project is going to be beautiful! the colors are wonderful. loving the new quilt! 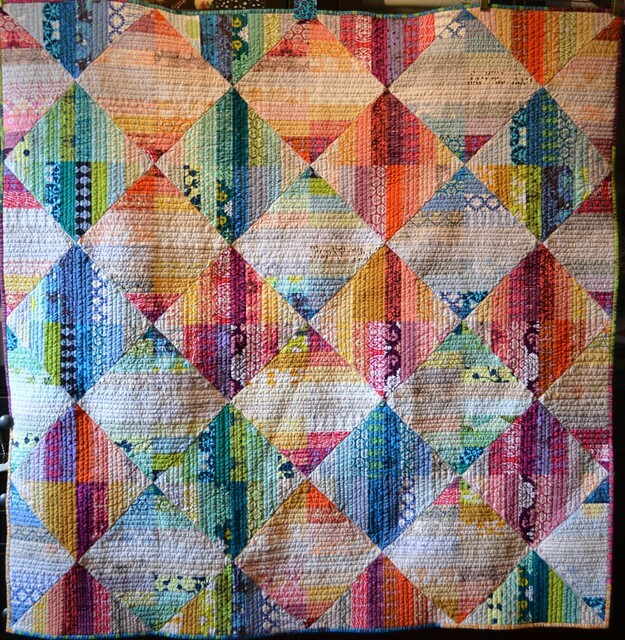 the idea of making a blended scraps quilt along with you is really tempting, but I'll have to wait until the weekend before I can even hazard a start! It's such a gorgeous quilt design! This is such a pretty way to work up your scraps. This is so pretty, now I just have to start sorting scraps! This is beautiful. I have scrap projects on the go too. Is there a code for the button? This quilt is going to be stunning! I laughed at your comment of making more scraps by using them. 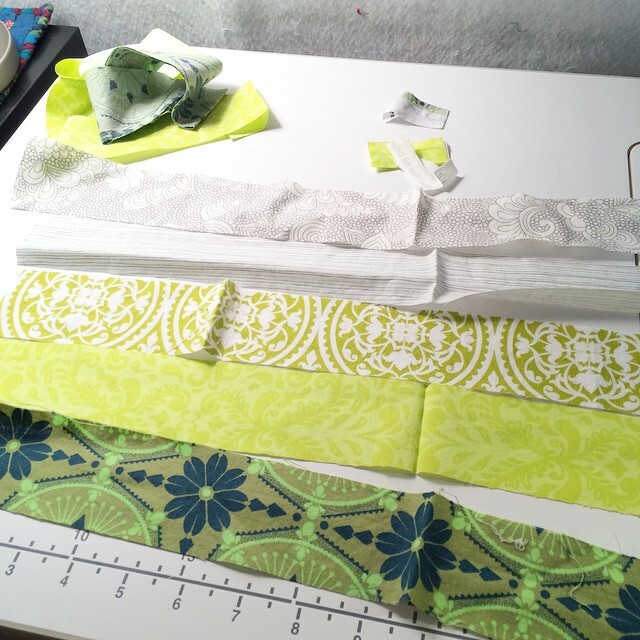 I recently pulled a bunch of fabrics to cut strips for some bee blocks and made quite the mess. Wished afterwards I had cut more extra strips while it was all out. I've thought I'd like to cut strips from a bunch of my older fabrics and then gradually work at making scrappy trip blocks but the thought of getting them all out and cut is more overwhelming than the idea of all that fabric in my cabinet. Maybe this winter . . .